We carry a full line of Coaxial Connectors, Adapters and Tools for your connectivity needs. 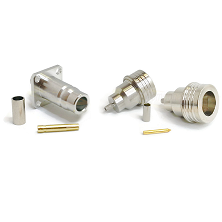 2.4mm Connectors 2.4mm Connector are designed for use with microwave applications requiring precision grade performance up to 50 GHz. Optimum results are achieved using outer conductor of 2.4mm diameter and air dielectric. The 2.4mm Connector series is mechanically compatible with 1.85mm connectors. Features Ultra Low VSWR and insertion loss. 7/16 DIN Connectors 7/16 Din Connector name originates from the size of the connector interface (7mm OD of inner contact and 16 mm ID of outer contact). 7/16 connectors are designed for use in communications systems with power levels of 100 watts. 7/16 DIN Connectors are available with Fast Shipping. BMA Connectors BMA connectors also known as “Blindmate” connectors are high-frequency, compact, 50-ohm, high-frequency using slide-on mating was developed in the 1980's. BMA connectors are ideal for use in rack-and-panel applications. Current configurations include Press Mount, PCB, 2 and 4 Hole Flange Mount, and for Semi Rigid Cables (.141, .085) in both straight and right angle designs. BNC Connectors Designing and building custom LMR100, QN Connector, BNC Attenuators and Coaxial Connectors with over 20 years of experience. MCX Connectors MCX connector - Field Components provides an extensive selection of high quality MCX connectors that fits your exact needs. MC Card Reverse Polarity Reverse Polarity MC Card Coaxial Connectors 50-ohm impedance connectors with snap-on coupling and a frequency range of DC-6GHz. MHV Connectors MHV Connectors can ship from stock for fast delivery, Field Components MHV Connectors are part of 250,000 standard and custom RF products. MHV Connectors have exceptional performance and reliability. MMCX Connector MMCX connector - Field Components designs, builds and supplies a comprehensive range of MMCX connectors to the electronics industry. QN Connectors We guarantee and stand behind our QN Connectors or any products we offer on the site. SMA Connectors SMA connectors | Get SMA connectors which are sub miniature units designed to provide high electrical performance for microwave applications. SMB Connectors SMB connectors - Field Components provides fast and reliable connection for smb connectors up to 4 GHz with high packing density. Connectors For LMR Cable We QC our LMR100, LMR200, LMR 240, LMR 400 Cable, Coaxial Connectors, 7/16 DIN Connector, SMA Attenuators and SMB Connectors delivering a perfect product every time.